I waited months to have our new craftsman style front door installed and now I finally have it painted! I special ordered the Jeldwen door to match the new garage doors and impatiently waited for it to be delivered and installed. It instantly changed the look and feel of our home and I knew right away I wanted to paint it my favorite color, Sherwin-Williams Iron Ore. Iron Ore is the perfect deep charcoal gray and adds a beautiful pop of contrast when paired with bright white trim. 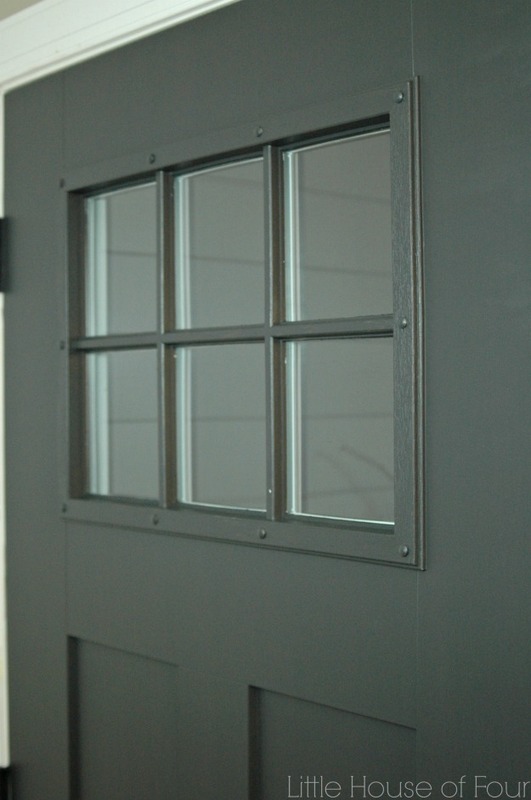 Here's how the outside of the door looked after it was installed. I ended up painting both the inside and outside of the door Iron Ore and I love how it looks from both inside and outside of our home. STEP ONE: Wipe down the door with mild soapy water to prepare the surface for painting. 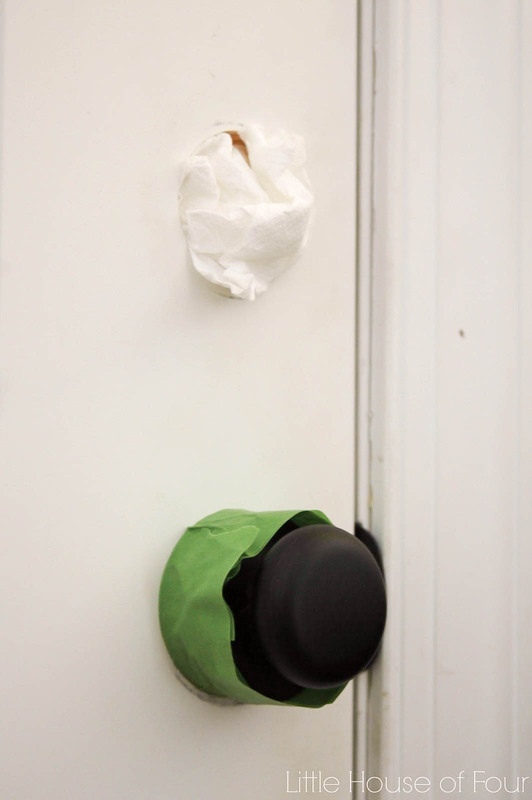 STEP TWO: Remove doorknobs or tape around them with Frog or Painter's tape. It was about 10 degrees outside and snowing when I decided to paint our front door, so I removed just one doorknob then taped around the other. I normally don't tape around the door hinges, but I did this time to limit how much I opened and closed the door. You can tape off as much or as little as you like. 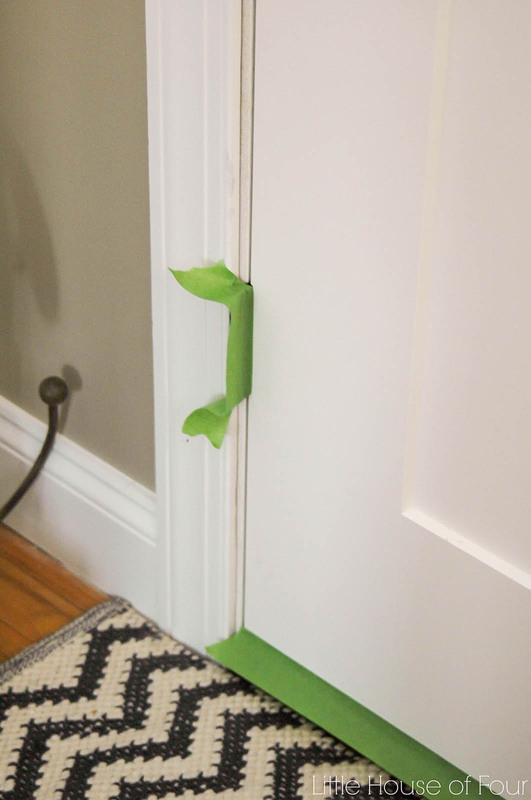 STEP THREE: Using a good quality angled brush, apply paint around the edges and any raised or recessed areas of the door. If the door you are painting has a wood grain, be sure to paint in the direction of the grain. I never worry about cutting in the grids and just try to paint them the best I can. STEP FOUR: Using a foam roller, apply paint to all flat areas of your door. Again, if the door you are painting has wood grain be sure to apply paint in the direction of the grain. 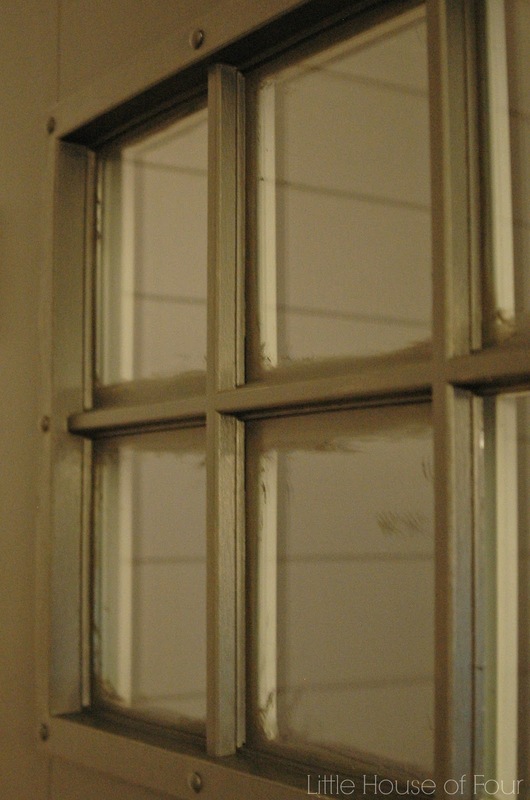 STEP FIVE: After the paint is dry, use a razor blade to scrape off any excess paint around the door grides. 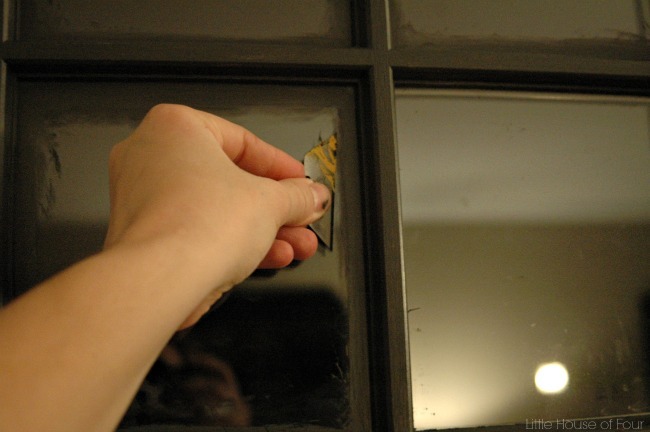 Simply hold the razor blade at a 45 degree angle and slide it against the glass to easily remove the paint. STEP SIX: Remove painters tape and reinstall any hardware that was removed. I just love how dramatic the entrance of our home looks and how the door poops against the white trim and shiplap wall. 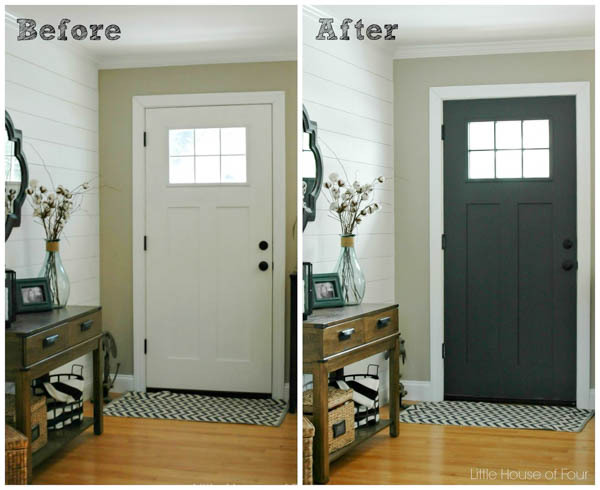 I have since painted all our interior and exterior doors as well as an accent wall in our bedroom of our home Sherwin-Williams Iron Ore.
And what would a makeover be without a before and after? WOW! Looks great! I love SW colors. Pinned! I love this! 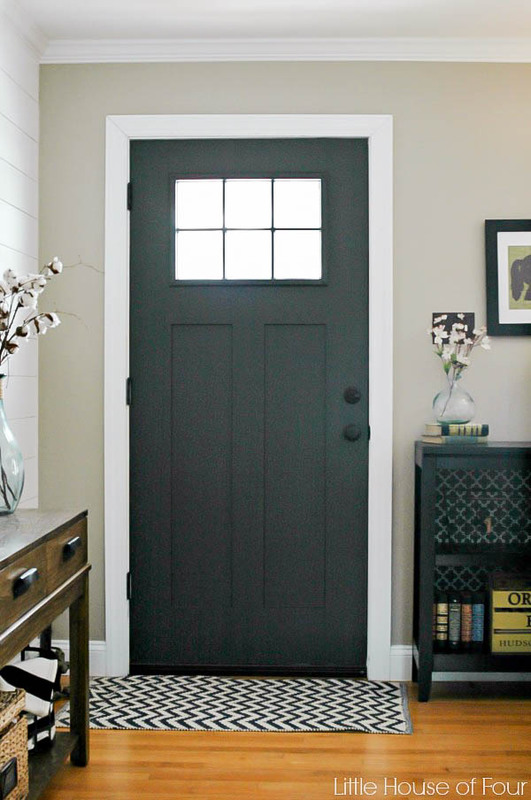 I have been pinning images of painted (black) interior doors--this is exactly the look I am going for but am really scared to do it. Thanks for more inspiration. Trust me, I was scared too! Although, after seeing so many beautiful images on Pinterest I knew I had to just go for it. I'm sure your door(s) will look amazing! Ha, great minds think alike! Your door looks great! It looks fabulous, Katie! I love how it pops alongside your white wall! It just might be giving me the courage to paint ours too! So sad to miss this challenge but look forward to next month's! I'm all about the dark doors, I say go for it and paint yours! Thanks for stopping by, looking forward to next month's challenge! Absolutly gorgeous! I'm planning to repaint my front door this Spring and this gives me great motivation! This looks beautiful, I actually really love your door, the little windows are cute! And your entrance is beautifully styled. Thank you so much Gilly! What an insane difference! I may be totally missing it in the old post, but do you have a link to the source of the door? I have GOT to get our floofy-brass-and-stained-glass outta here! We went with fiberglass since it doesn't heat up or dent like our old metal door. They are more expensive, but worth the added cost. Love the color you chose and it looks stunning with your new plank wall!!! Love love love!!! I love the new color! I repainted our front door but could not talk someone into a color so it was painted white... I plan on repainting it again next year and I am loving the darker doors maybe just maybe I can talk him into it. I completely agree, you should definitely be happy in your home. Thank you so much for taking the time to stop by! I'm sure your entryway will look amazing. I love how this turned out! I've been contemplating painting the back of our front door for months, but I can't decide between dark gray or blue. But, you may have swayed me toward gray! I love it. Looks so nice. I painted mine a dark brown a year ago and I love it..thinking of doing all inside doors. Oh, I just love dark doors! We painted the door going in to our garage a similar color about 5 years ago and it still makes me happy every day! :) Thanks for linking up at The Creative Circle - you know I love your entry! I hope you'll link up again this week! That new door color adds so much drama to the space. I love it! The dark door looks awesome!!! Love the windows in the door too. We recently painted our front door too and it makes such a huge difference. Such a big transformation! It really rolls out the welcome mat and says "come on in"! This is the perfect inspiration for me - I recently painted our foyer white and now the white door blends in way too much with the walls. I LOVE the color that you chose for yours! Thanks for sharing on Best of the Nest! 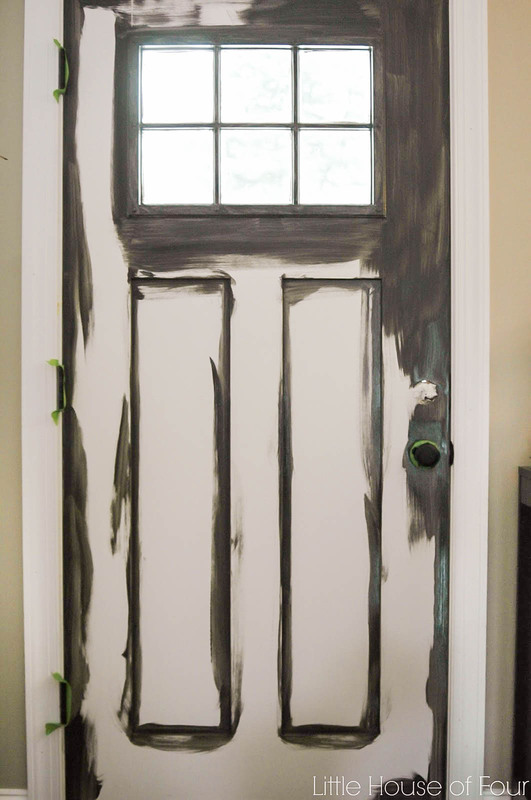 Great idea to paint to door - and so brave of you to go ahead with it instead of waiting! 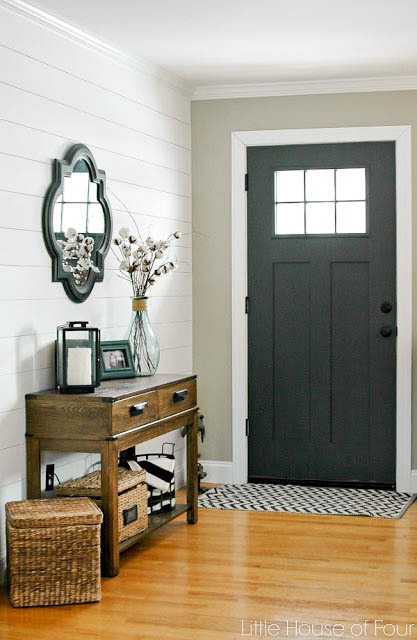 It looks wonderful and give your entryway a finished look. I have to do something. It is driving me crazy. I am curious about the wall color as well. I LOVE THIS! What colour are your entry plank walls??? May I ask where you got the door itself? I am looking for one just like this. Beautiful color! Thank you! The door was a special order Jeldwen door from Home Depot. I hope that helps! What color are your walls? They look a touch darker than mine but seeing this has me leaning toward painting mine dark too! Hi beautiful entry way. Wondered if you could share the name of the wall color? 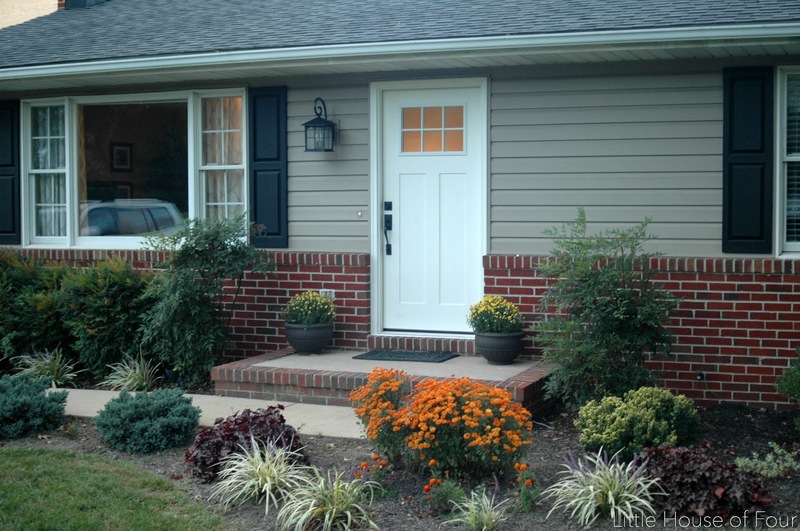 What style of sherwin williams paint did you use on the door? What finish is this? I love how matte it looks but I'm afraid it will scratch. That looks great!! I was also wondering if you could tell me where you found your entryway table with the drawers and bottom shelf? It's really cute! Please please oh please tell us the color of the wall around door!! The wall color is Sherwin-Williams Balanced Beige. I always drool over your entryway every time I see a picture of it. What color is your plank wall? I also want to ask about painting the front door. If I only paint the v inside with the Iron Ore, do I paint the edge that latches too or leave it the color of the outside?